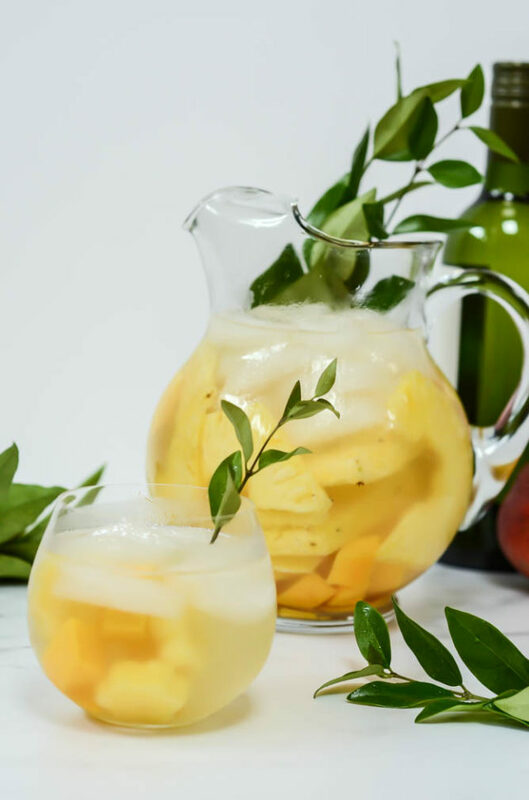 A unique, refreshing tropical sangria featuring some of the best flavors of the islands. 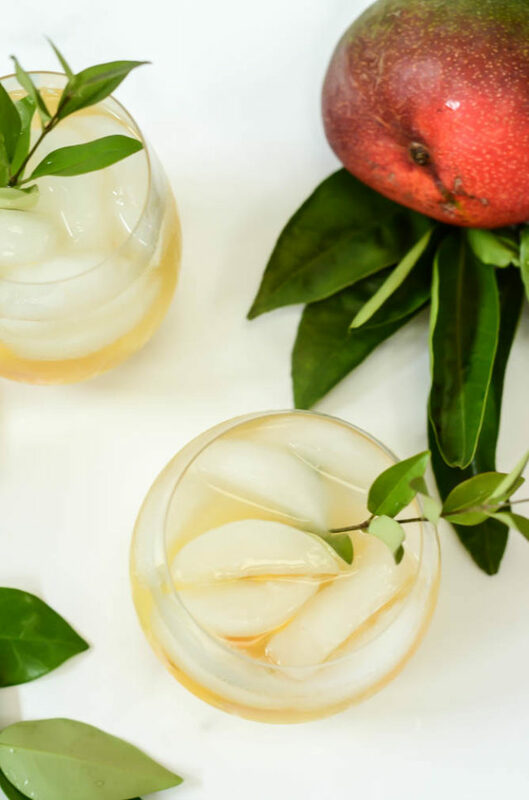 Pineapple, mango, white wine and RUM all come together in a delicious drink that’s fit for a crowd. Okay, I just want to start off by saying I am completely aware that this is the second tropical recipe I’ve posted in a row, but I don’t think you’ll blame me once you see what I have in store for you. 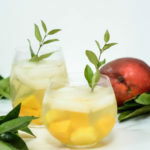 This refreshing Tropical Sangria was inspired by our trip to Hawaii a couple of weeks ago, and I have to say it is one of the best sangrias I’ve tasted in a loooooong time. If you think about it, it’s pretty amazing that there aren’t more recipes for Tropical Sangria out there in the world. I saw it on the menu of the pool bar at the condos we stayed at on Oahu and, although I never got a chance to try that one (well, I had the chance, the mai tai I had from them was just enough to discourage me from trying any more of their mixed drinks), I knew I wanted to try and make my own – and undoubtedly better – version as soon as we got home. 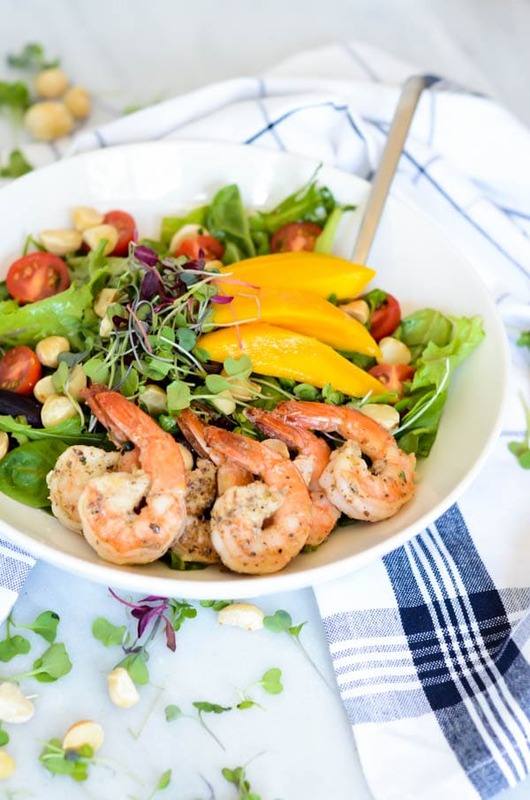 If we’re thinking “tropical,” of course we’re going to go with a white wine base. And we’re not talking chardonnay – this white wine needs to be crisp, refreshing, herbaceous and, yes, tropical. I went for a Sauvignon Blanc, but a Pinot Grigio would be great as well. The next step is to find the most tropical fruit that you can. 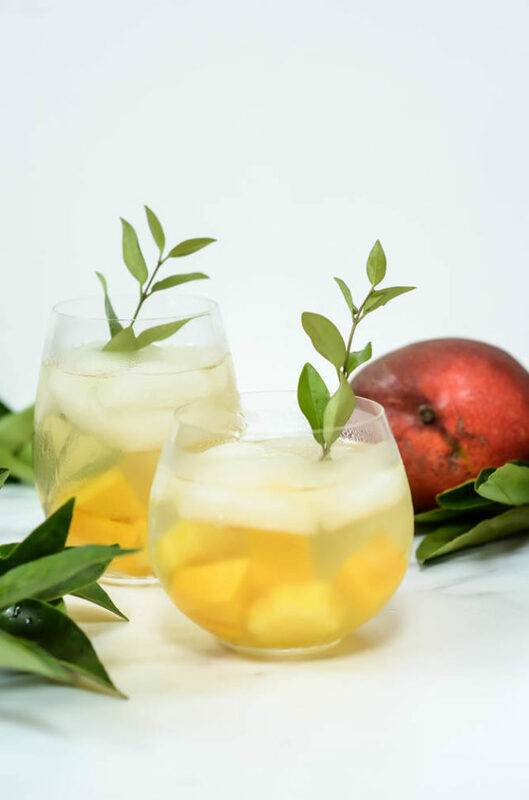 Pineapple and mango always seem to be a safe bet here on the mainland, but you could also incorporate things like passion fruit, guava or even lychee if you can find them. Now, I don’t know about you, but I like my sangria to be a little more “high octane” than just your average bottle of wine. And don’t even talk to me about adding any sort of soda water. I think it just waters things down wayyyyyy too much, especially since our Tropical Sangria is going to be served over plenty of ice. This is where the rum comes in! I mean, come on, there’s no liquor that’s quite more tropical than that. Finally, there are a couple of other not-so-secret ingredients that really seal the deal, and they’re ingredients you’ll find in many of your favorite tiki drinks. We’re talking orange curacao and orgeat. Sure, you could leave them out, but I love the extra dimension they give the drink and they truly do make it taste much more tropical. One thing I love about this drink (aside from how tasty it is) is that, unlike many other cocktails, this makes a huge batch. 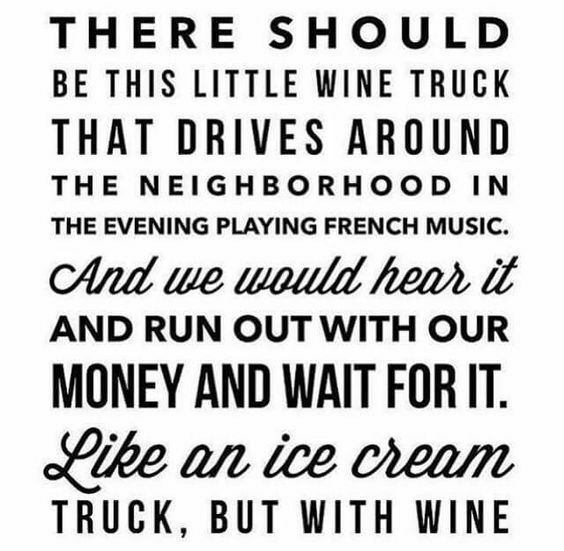 In other words, it’s perfect for a party! I recommend mixing it up in a pitcher in advance and getting the sangria nice and chilled – sans ice – until you’re ready to serve. When it comes time for your guests to whet their whistles, just scoop the ice into the individual glasses and pour the sangria over it. 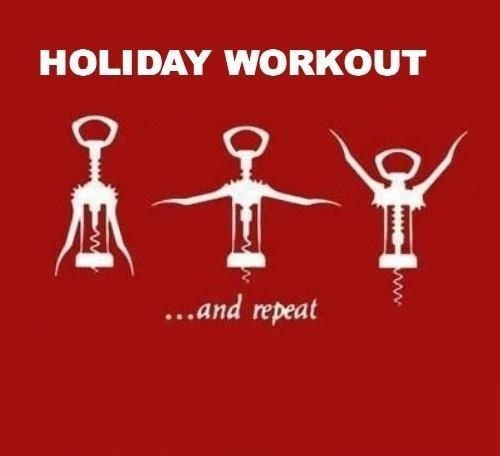 Don’t forget to scoop out some of the fruit into each glass! That booze-infused juiciness is the best part. 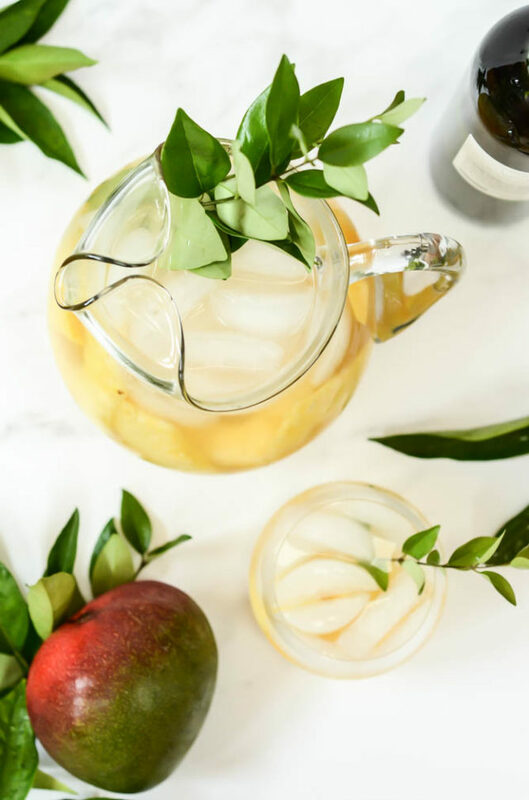 If you ask me, this Tropical Sangria is the perfect drink for your long Labor Day weekend. No matter where you find yourself, everyone can use a little island flavor in their life, right? Place mango and pineapple in the bottom of a large pitcher. Pour all other ingredients into pitcher and stir. 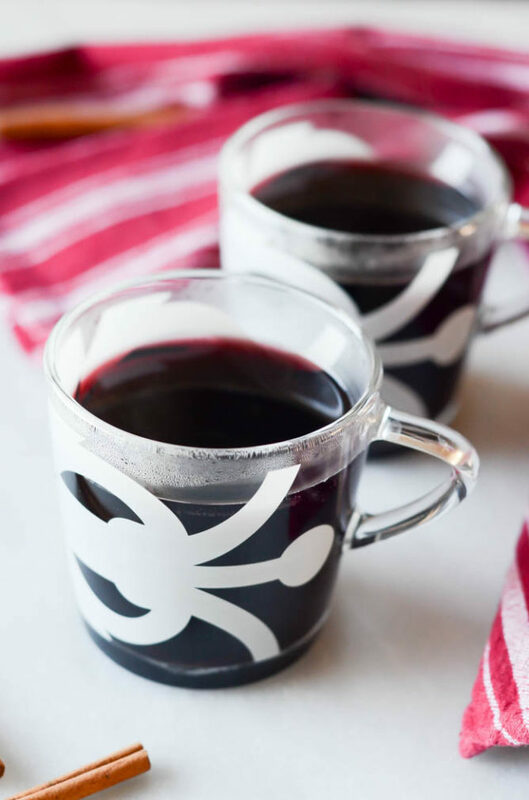 Pour into individual wine glasses filled with ice to serve. Be sure to scoop in some of the fruit! 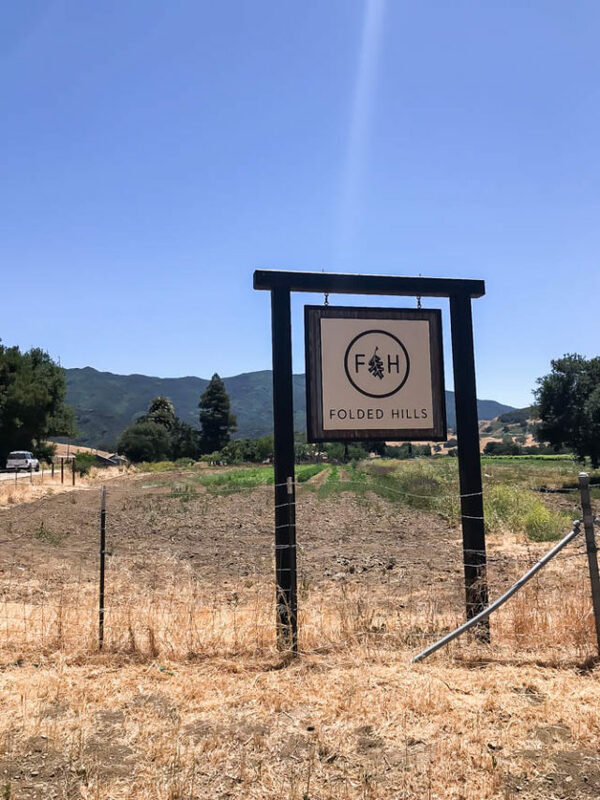 A recap of our fun and DELICIOUS afternoon at Folded Hills – a Central Coast treasure that is definitely worth adding to the itinerary for your next California visit! I’ve lived in Santa Barbara for five years now and I’m still discovering new and exciting places every day, meeting more fabulous people and learning about places that I just HAVE to visit. When I attended a Women in Wine dinner a few months ago – celebrating some of the best female winemakers in Santa Barbara County – I was blown away by the strength and presentation of all these ladies, and there were a few who really stuck out. 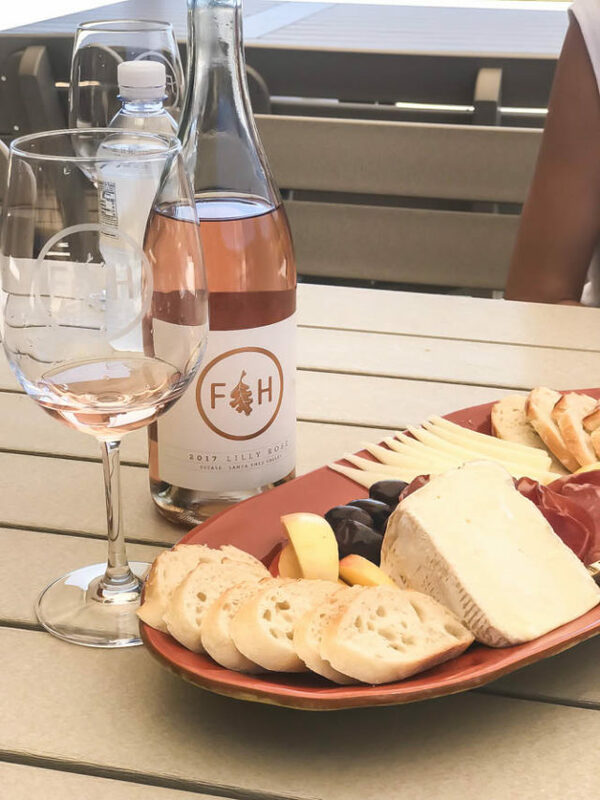 The very first wine I tasted that night was a rosé from Folded Hills, and I knew immediately that this was a winery I needed to become familiar with. So when the opportunity arose to head there for an afternoon visit with my gal Hana-Lee (from Wander & Wine) and owner Kim Busch, I absolutely could not (and would not) refuse. But it wasn’t just the wine that piqued my interest about this place. After all, it’s not very often that I encounter a winery that’s also a fully functioning farm, practice polo field and historic residence. And did I mention the baked goods? I mean, the cookie and Rice Krispie treats are reasons in themselves to make a stop the next time you’re cruising down the 101. 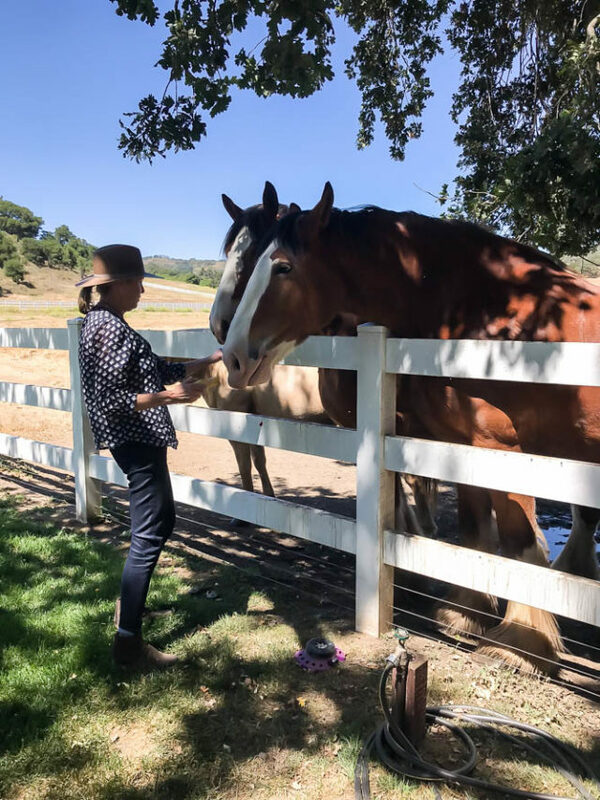 We arrived at the Folded Hills farmstead on a Friday afternoon and met up with Kim, who had come armed with not only the above-mentioned baked goodies but also buckets full of food for their furry farm animals. Our babes loved watching her feed the pigs, donkeys and goats almost as much as Hana-Lee and I loved the giant chocolate chip cookie we shared. 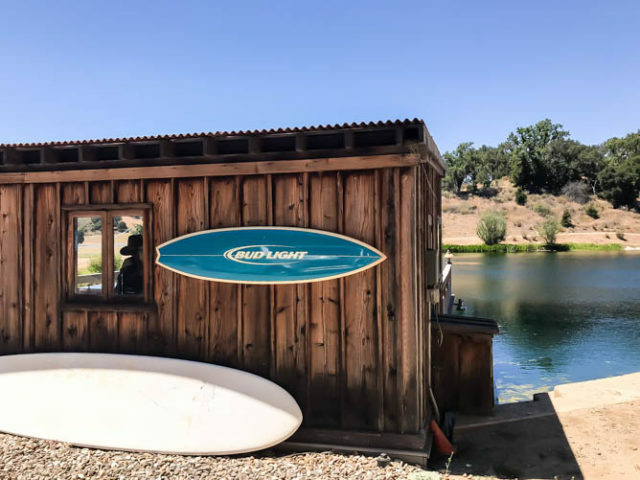 From the dock we headed further into the property, with a quick stop to feed the Clydesdales and tour the newly remodeled guest house before winding up on the back porch of the family’s historic home to taste the last two wines, the August Red and the Ballard Canyon Grenache. I already knew I loved the rosé, but after tasting all these other wines it’s quite apparent that winemaker Angela Osborne is doing everything right. If you’re looking to add a stop at Folded Hills to your next California Coast travel itinerary (and you most certainly should) take special note: the Farmstead is open weekends through October and, until construction is complete on the new tasting room (hopefully next spring), you’ll have to call or email in advance to taste the wine. But man, is it worth it! 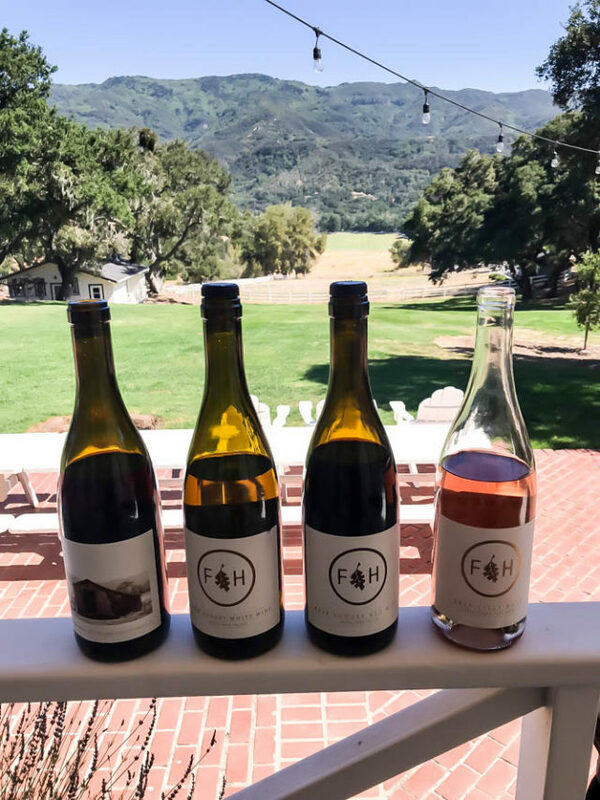 Until the tasting room opens, you can sign up for Folded Hills’ mailing list to be notified of new releases when they’re available and, if you live in Santa Barbara, you might be able to find the rosé at a couple of our local wine shops (email me for specifics!) 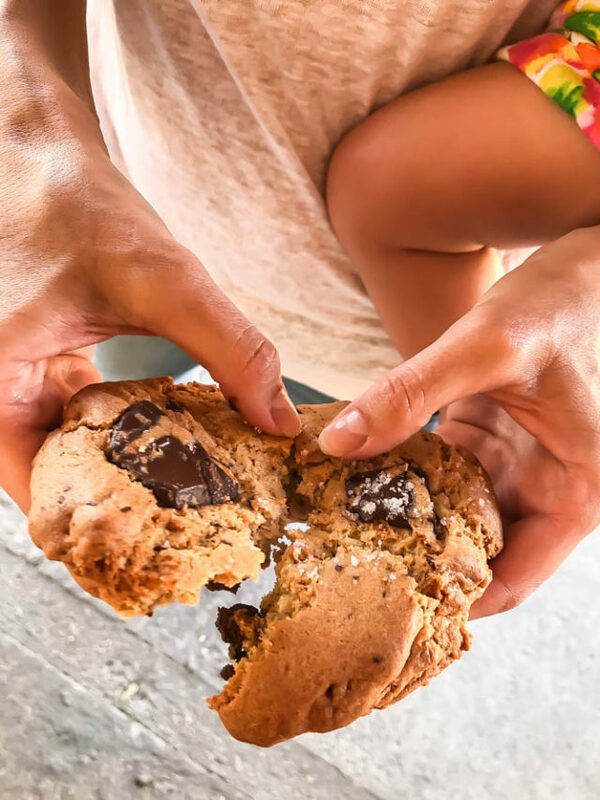 In the meantime, I highly recommend you stop by Folded Hills on your next trip up or down the 101 (the turn-off is approximately 30 minutes north of Santa Barbara) – if nothing else but for a giant chocolate chip cookie! 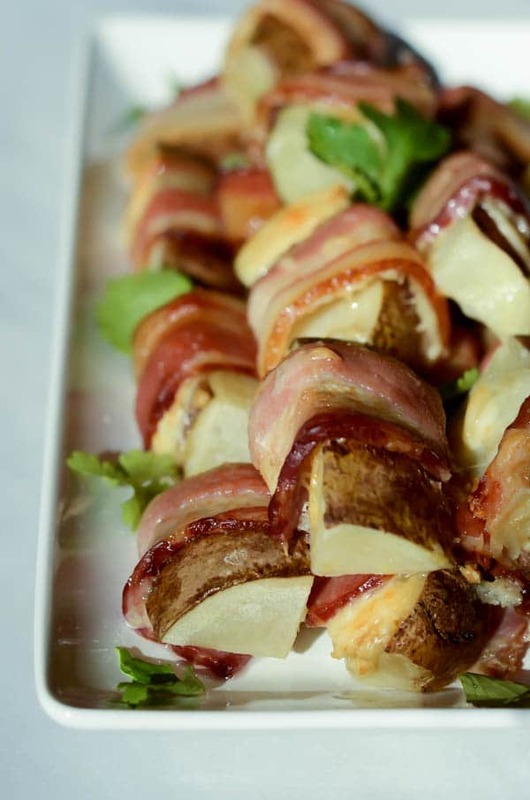 These bite-size hors d’oevures are perfectly balanced with sweet, salt and tangy flavors. 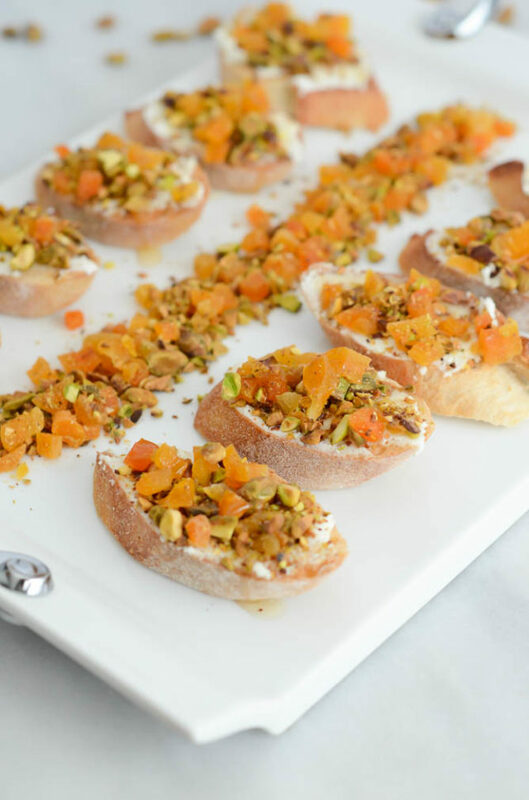 Pistachios, goat cheese and apricots are a match made in heaven! I’ve always been a snacker. When given the choice between a gigantic meal that will likely leave me bloated and sluggish or light snacks throughout the day, I’ll 100% of the time go for the latter. Plus, that way I get to try allll of the different things. Don’t pin me down, I want to taste all the food! Speaking of snacking, the hubby and I are especially good at it on the weekends, and this past weekend (wait, are we still in “the weekend” since today is President’s Day?) was no exception. 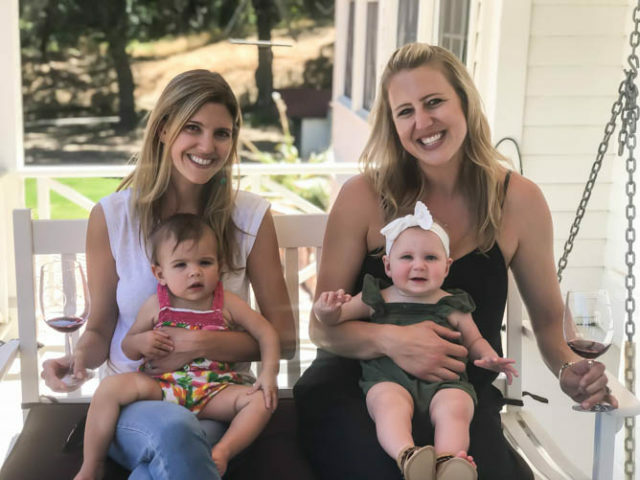 We were up in NorCal for a baby shower on Saturday, then took advantage of the long weekend and being so close to Napa and headed up to Wine Country on Sunday. We’re headed back to SB but will be back up in NorCal next weekend. It’s turning into quite the frequent commute for us, but we don’t mind the drive. We always joke that we’d rather make the 4-6 hour drive up to the Bay Area than the 2-3 hour drive down to LA because we never hit any traffic. Anyhow, we really enjoyed seeing so many of our NorCal friends this past weekend. It seems like with the craziness of the holidays and the subsequent need to just hibernate and do nothing in the beginning of the new year, it’s been ages since we’ve seen everyone. Now we’re celebrating babies and multiple engagements and I can’t believe all of that has happened since we’ve last seen everyone! 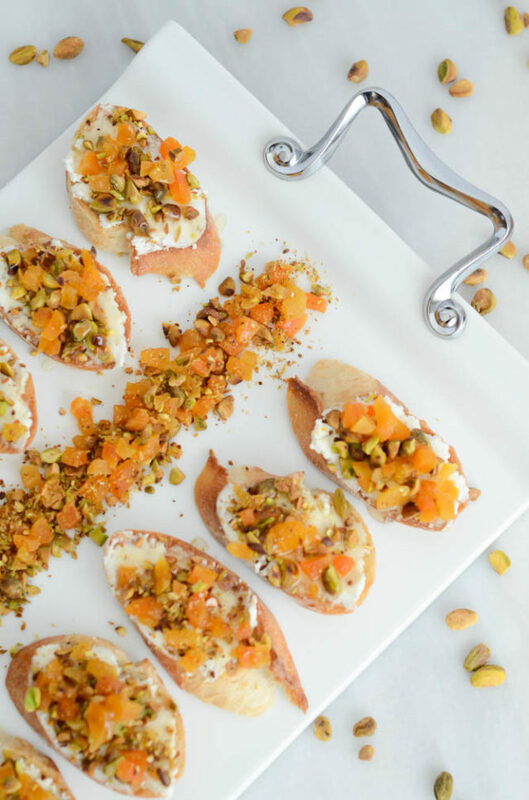 These Goat Cheese, Apricot and Pistachio Crostini with Honey are just the type of thing I like to make for casual get-togethers with our friends, no matter where we are. They’re pretty darn easy and require almost no actual cooking, so you can really whip them up anywhere. Might I also add that they’re the perfect things to munch on when you’re sipping on some delicious Napa wine? Let me tell you, these crostini and a crisp, refreshing Sauvignon Blanc are a match made in heaven. The hardest part about this recipe is literally toasting up the sliced baguette to make crostini. If you can toast bread under a broiler without burning it, you’re in good shape. 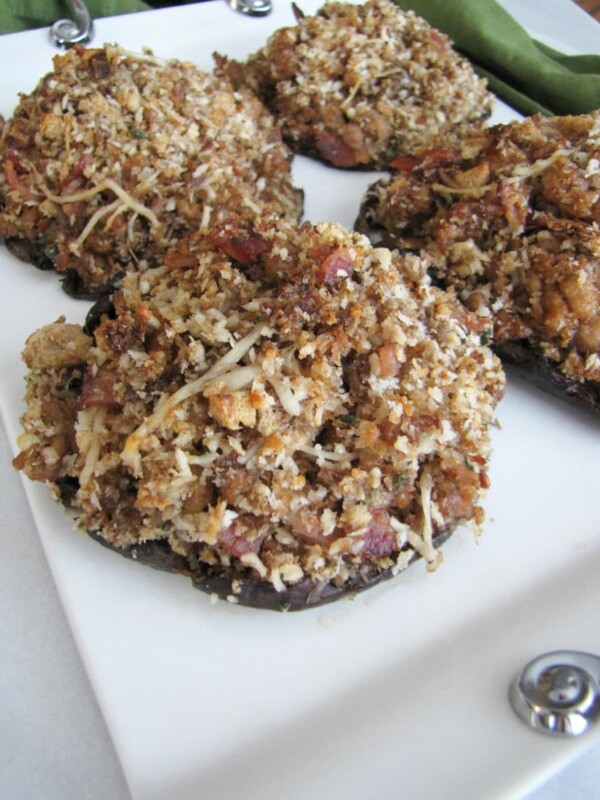 If not, just add the toppings to untoasted bread and these puppies will still taste absolutely divine. After you have your baguette slices toasted, simply spread each one with a hefty dollop of chevre (that’s creamy goat cheese for all you non-cheese snobs out there), top with the apricot and pistachio mixture, and drizzle on some honey. That’s it! Toast your nuts. I know, this technically requires more cooking, but it’s a must for ANY recipe that involves nuts. Just trust me. Chop your dried apricots. Nobody wants a crostini where they have to gnaw through a huge chunk of something so they can be sure to get a taste of it in every bit. Also, I’m a huge fan of the fatter, juicier dried apricots as opposed to the flatter, more dehydrated ones. They are definitely a must IMHO. 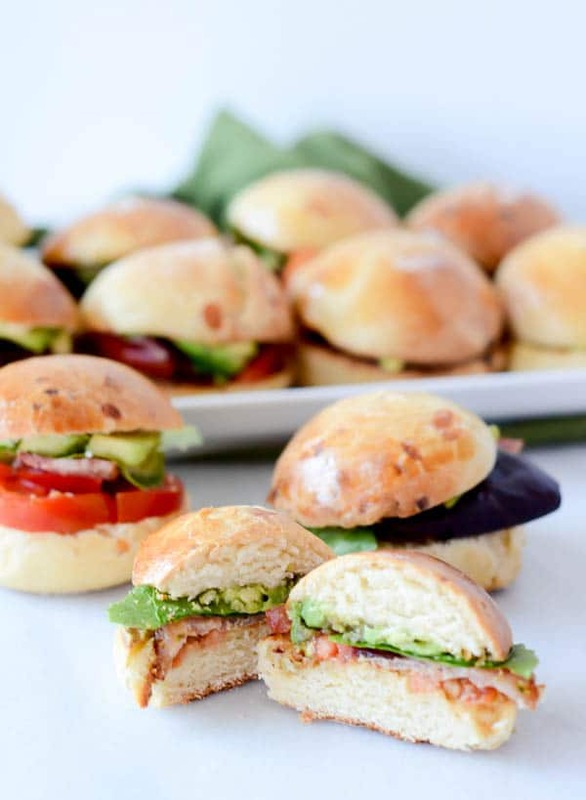 These bite-size hors d'oevures are perfectly balanced with sweet, salt and tangy flavors. 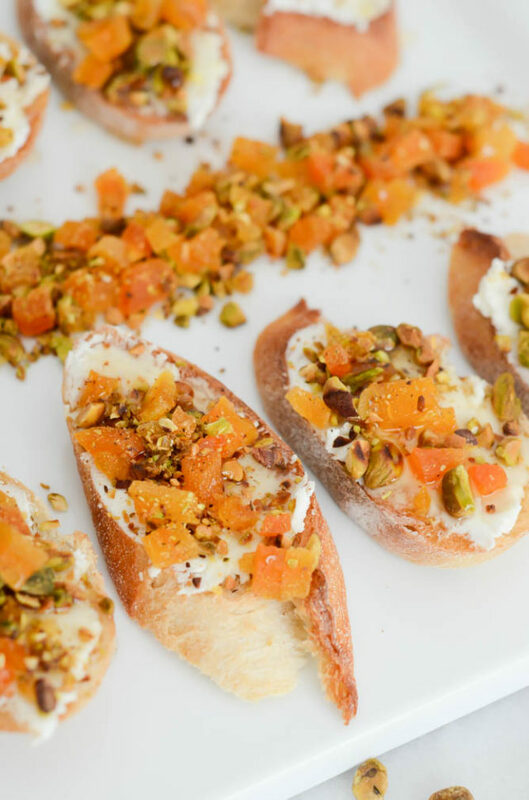 Pistachios, goat cheese and apricots are a match made in heaven! Turn the broiler on high. Arrange the baguette slices on a sheet pan and place under the broiler for about 5 minutes, or until they become golden-brown. Keep a close eye on them, as they can get too dark in a matter of seconds. 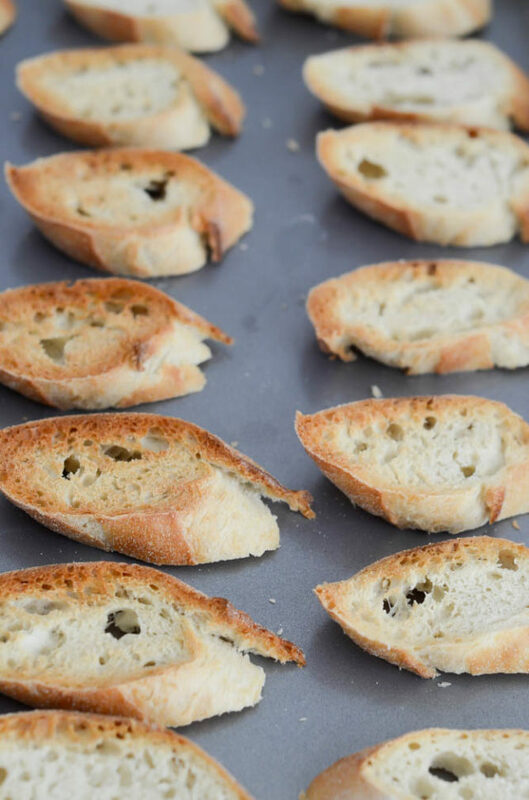 Remove crostini from the oven and let cool slightly. Once cool enough to touch, spread about a tablespoon or so of the goat cheese on each piece. 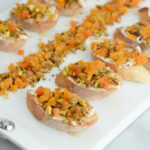 Combine the pistachios and dried apricots in a small bowl, then sprinkle on top of each crostini. Drizzle each piece with honey and serve immediately. Sorry, I just couldn’t resist. I’m continuing my Canada-themed week with the perfect cold weather cocktail. In fact, it’s rumored to be so good at making you forget that you’re in below-freezing temperatures that it can be dangerous once you head back inside. True story, or at least that’s what we were told. So here’s how this belly-warming red wine, whiskey and maple syrup cocktail came to be featured on this here blog: On our trip to Quebec (I know, I know, I keep talking about it, but I promise to have a Travel Diaries post for you next week!) my friend Johanna and I were looking up local food and drinks that we just HAD to try while we were there. On our last night, we decided to brave the 10 degree temperatures and hit the German Christmas Markets, but we knew we’d need some libations to keep us warm and toasty as we wandered around outside. After a quick Google search we realized that what we’d be looking for is a Canadian drink known as the “Caribou,” because (a) it was served warm and (b) well, it was Canadian. We found a fun pub just across the street from the Christmas Markets and decided to post up there for a bit to warm up both our bodies and our bellies, and proceeded to ask the bartender for a Caribou. He was a little confused at first (I guess it’s not as popular as we thought? At least not in Quebec) but eventually produced a liquor bottle that claimed it was Caribou. Now, this was pre-mixed stuff, and he served it to us cold, but it was interesting nonetheless and I immediately knew I wanted to try and make a legit, warm version as soon as I got home. After a bit of further research, we discovered that a Caribou typically contains red wine, whiskey and maple syrup. It sounded easy enough to make on our own! 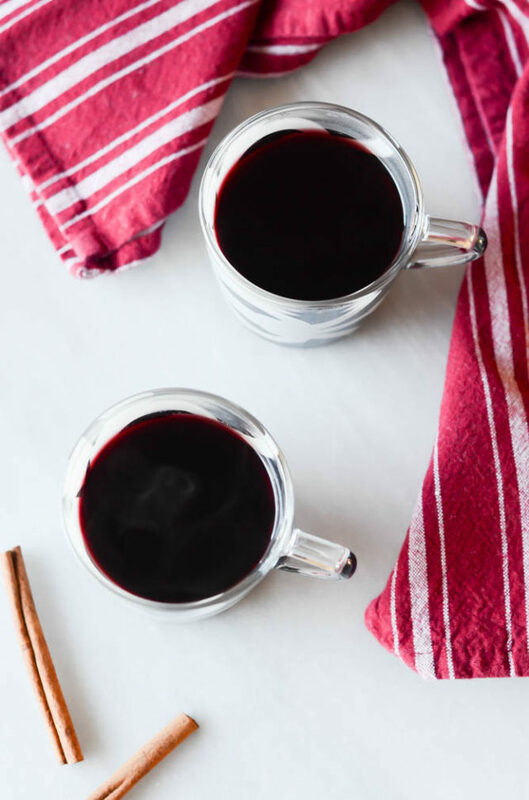 And seeing as we’re heading to Tahoe this weekend with the fam (in 20-degree weather nonetheless) I figured there was no time like the present to perfect this high-octane mulled wine. And perfect it I did! 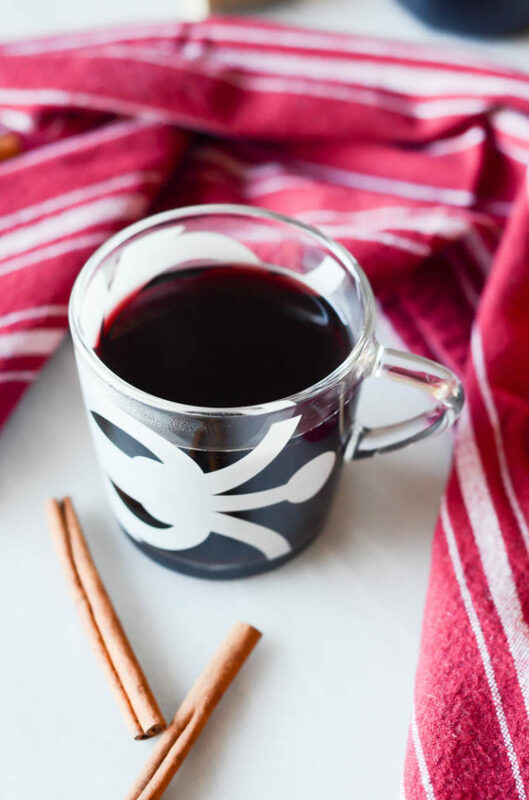 I strayed slightly from the original recipe in that I added a cinnamon stick, but I feel like any wine served warm (or whiskey for that matter) needs just a touch of spice. 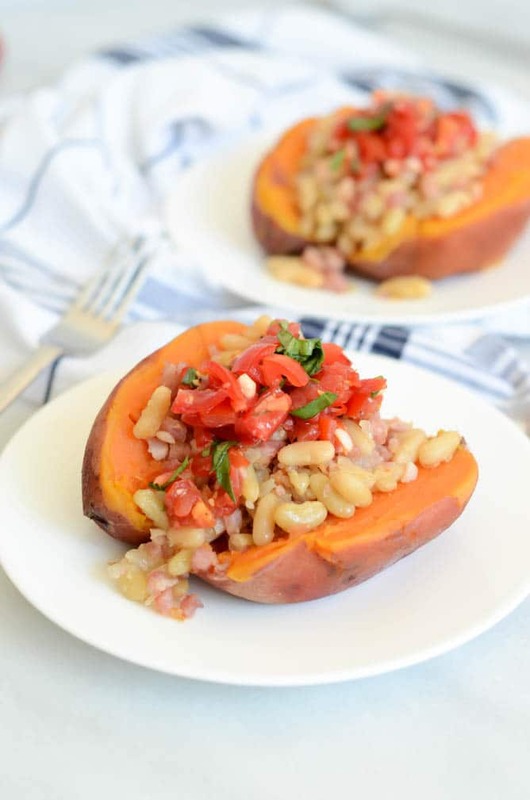 This recipe is incredibly easy to make, and as long as you have all of the ingredients on hand, all you have to do is throw them into a saucepan and heat them up. Although I have not yet consumed enough Caribou in one sitting to worry about it, I feel obliged to tell you a little story we heard from the couple sitting next to us at the pub in Quebec where we enjoyed our Caribou. After they helped translate what we were looking for to our waiter, this friendly couple visiting from Montreal started giggling a bit at our request. We asked them why they were giggling, and if we should be worried about this “local” drink we were ordering. They told us that Caribou is what everyone drinks during the city’s month-long Winter Carnival celebration…with the goal of drinking enough so that they don’t feel the cold. Hey, that sounded a lot like us! BUT, they cautioned, the problem with Caribou is that if you drink too much and then go out into the cold weather, you don’t notice how much it’s hit you until you head back inside, at which point you’re apparently a mess and can’t remember anything the next day. Ahhhhhh….that’s why this was so funny. Here we were, just two American blondes, sipping on one stiff pour of ICED Caribou in preparation for our trek through the German Christmas Markets. So, no, we did not get sick, or even feel the slightest bit of a buzz, but I feel it’s my duty to give you fair forewarning. We are, after all, talking about a cocktail made up of solely red wine AND whiskey. My message to you is that if you are headed (or live) anywhere frigid, you most definitely must try this unique Canadian cocktail, but sip with caution and know that it can pack a punch. Hopefully you won’t be driving anywhere anyway! 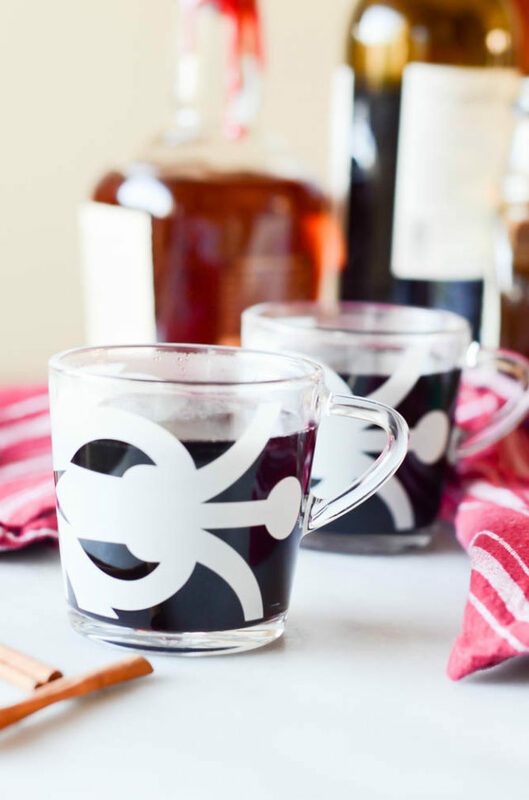 A Canadian classic that's perfect for cold weather drinking - red wine, whiskey and maple syrup served warm with just a touch of cinnamon. Combine all ingredients in a small saucepan over medium heat. Bring to a gentle simmer, stirring every once in a while, and then remove from heat. Pour into mugs and serve immediately. With Halloween behind us, it’s time to start thinking about our menus (and beverages!) for the incredibly food-centric holidays that are upon us. 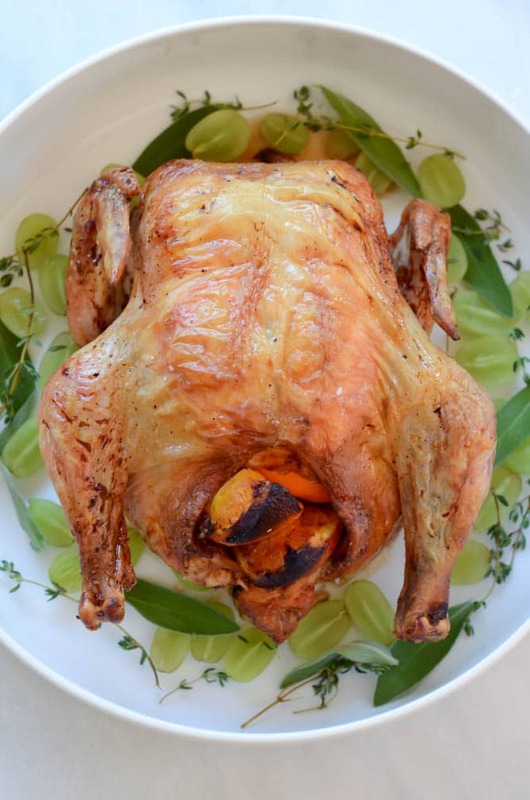 I know many of you (like me) have already been mulling ideas over in your head thinking about (a) which dishes would be a huge hit with your family and friends and (b) how MANY delicious dishes you can feasibly pull off. Because you’ve already got enough to worry about with making the food, cleaning the house, decorating, and dealing with all the family drama, etc., I thought I’d help out by taking away some of the uncertainty you might have when deciding which wines you want to crack open with all of your special holiday meals. 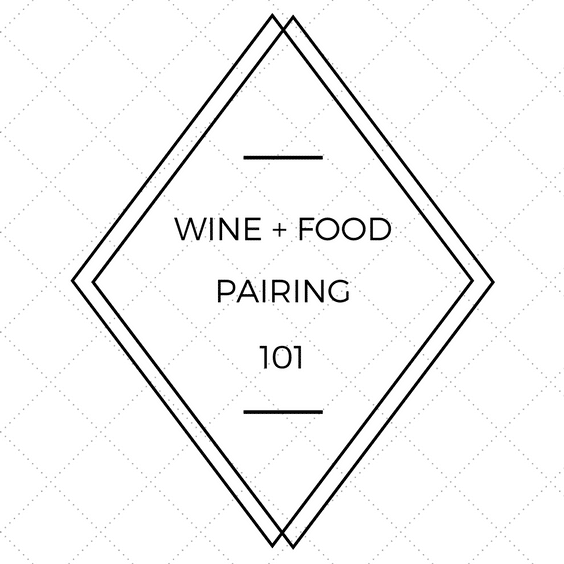 That’s right folks, this here post is the answer to all of your most daunting questions about which wines to pair with which foods. I’ve kept it short and sweet here, since this “cork dork” can go on about wine and food pairings for dayzzzzzz, but you know I’m always here to help if you have other questions or are perhaps serving something that I haven’t touched upon here. 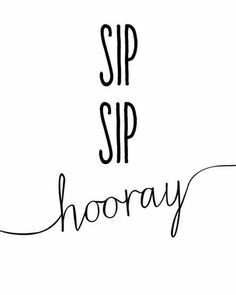 And don’t forget, I can now come to YOU to do a personal Wine Education Class (which, really, should be called a party) for you and your friends. Be sure to check out my Services page to see what’s available. So, without further ado, let’s get started! The Scoop: There are two main camps of Chardonnay, oaked and unoaked. Often you’ll discover that you’re a fan of one or the other, but I personally enjoy both. The oaked Chardonnays are the ones you’ll have heard described as “buttery,” while the unoaked Chardonnays are aged in stainless steel and therefore have a crisper, more acidic taste to them. You may also see Chardonnays that have been aged in a combination of oak and stainless steel. These are frequently my favorites! What to Eat with Oaked Chardonnays? What to Eat with Unoaked Chardonnays? The Scoop: Sauvignon Blanc tends to be herbaceous and full of tropical citrus notes, making it a great pairing for fresh vegetable dishes. It’s a lighter white, perfect for serving at a brunch or as guests arrive for Thanksgiving dinner. It tends to be on the lighter side, which means it can easily be enjoyed alone. New Zealand Sauvignon Blancs tend to have a grassier, more herbaceous flavor, while Sauvignon Blancs from the United States tend to be fruitier and more citrusy. What to Eat with Sauvignon Blanc? The Scoop: Pinot Grigio/Pinot Gris has gotten somewhat of a bad rap due to being historically “bland” or “uninteresting.” That being said, many wineries are stepping up to the plate and making delicious and intriguing versions of the varietals. They’re popular in France and Italy, light wines that are quite refreshing. Although they may not stand up well against some of the heavier, more intense dishes you’ll be making during the holidays, they’re another great wine to greet your guests with or serve while everyone is lounging around during the long weekend. 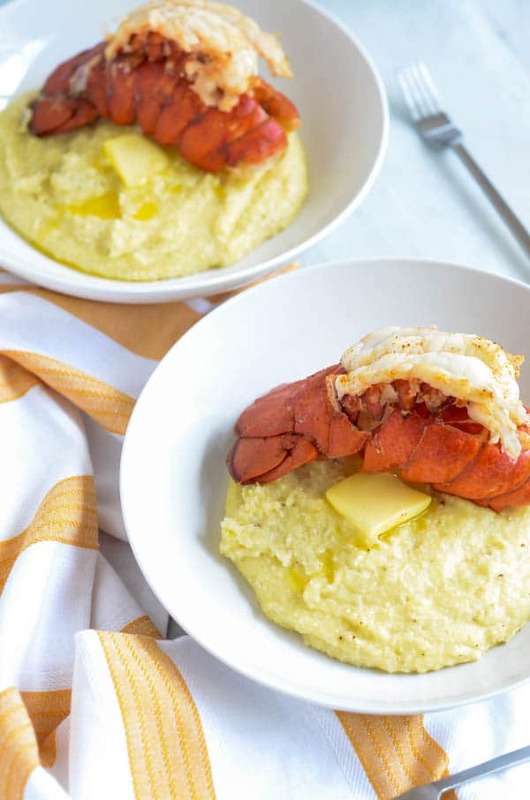 What to Eat with Pinot Grigio/Pinot Gris? The Scoop: I like to lump these all together in a group I call the “aromatic varietals.” They are incredibly floral on the nose, with hints of honeysuckle, jasmine and lychee. They are also made in a range from very sweet to almost bone dry, making them great companions for exotic, spicy food. If you taste one of these varietals and don’t enjoy it, don’t be discouraged! Simply be sure to try a different one the next time around. They come in so many different styles that eventually you’re sure to come across one you enjoy when paired with the right food. 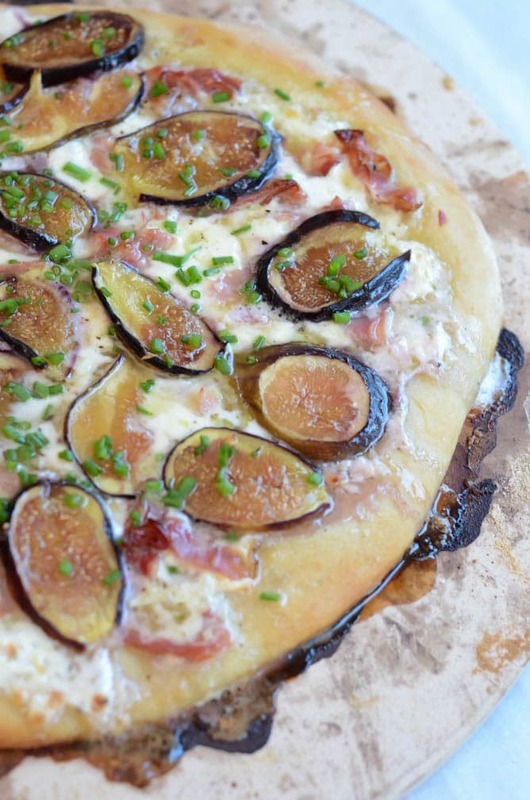 What to Eat with Aromatic Varietals? 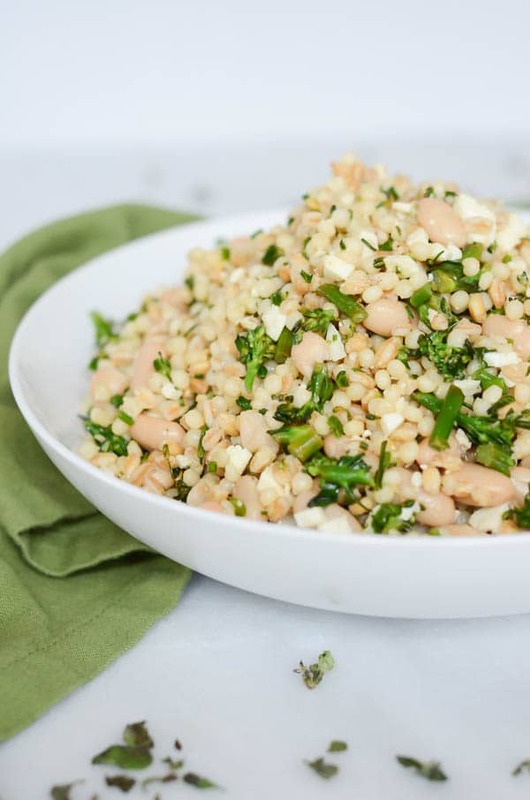 The Scoop: My favorite, and incredibly food-friendly! I know we all favorably refer to all sparkling wines as “Champagne,” but in reality, only wines hailing from the Champagne region of France can be heralded with that name. All other sparkling wine must be called something different. We have Cava, from Spain, Prosecco, from Italy, and Sekt from Germany and Austria. We’ve failed to come up with something creative here in the U.S., so our domestic sparkling wines are called just that: sparkling wine. No matter what type of “sparkling wine” you’re consuming, there’s always an excuse to pop a bottle. What to Eat with Sparkling Wines? The Scoop: Our favorite happy medium between red and white wine. There are many different types of rose, but they always fall in the middle of the color spectrum. 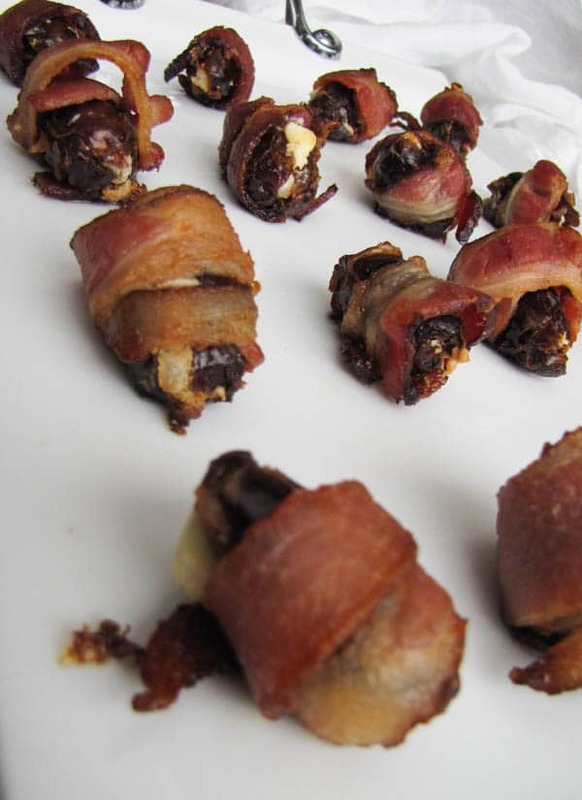 They can be sweet or dry, dark or light, made from any number of different grape varietals. This is another type of wine where you may need to try a few different incarnations before you find the perfect one for you. What to Eat with Rose? The Scoop: The king of….wines? Probably the most recognized (and consumed) red wine out there, or at least in California. Thanks to the Napa Valley and its esteemed success, Cabernet Sauvignon is stranger to no one. It’s a bigger red wine, dare I say #basic? 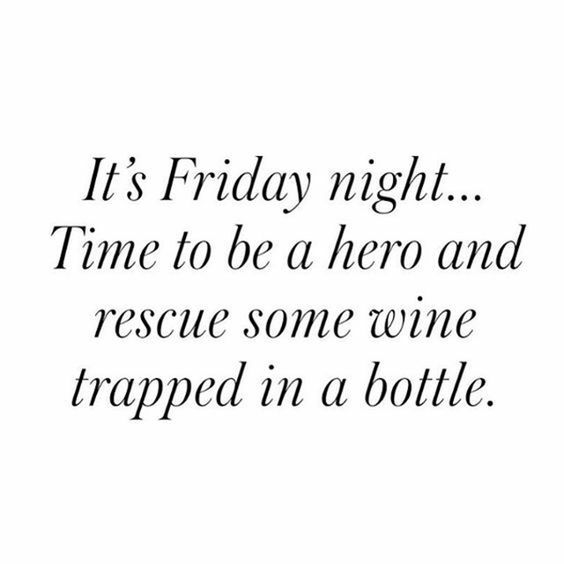 That’s unfair, because there are plenty of over-the-top delicious Cabs and Cab blends out there and I’m the first to jump at the chance to buy them. 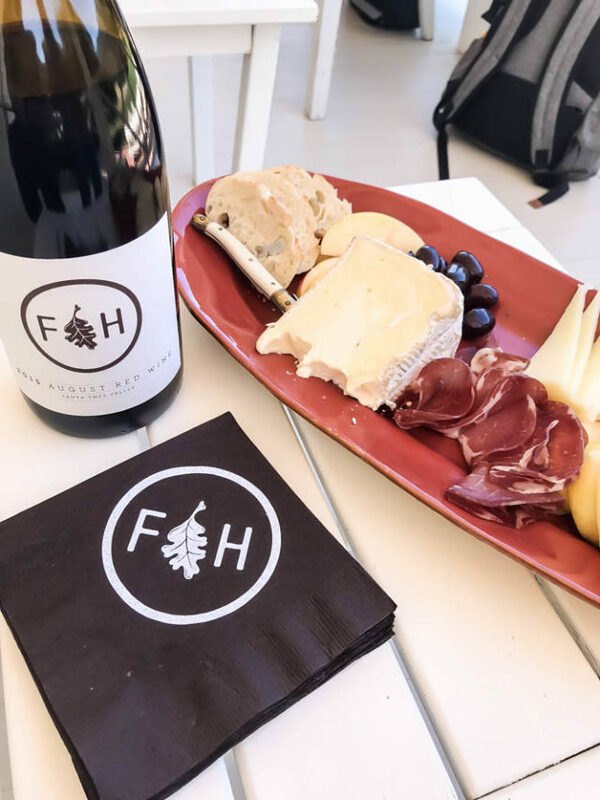 What I mean when I say “basic,” is this varietal goes with just about any food you’d think would “pair well with red wine.” If you’re a novice wine consumer, be sure to get yourself acquainted with these quickly! What to Eat with Cabernet Sauvignon? The Scoop: The lightest of all red wines, Pinot Noir is a perfect “bridge” varietal. It’s great for those “in between” dishes, like seafood with a red sauce, turkey with stuffing, etc. In fact, a Pinot Noir is one of the most perfect wines you could pair with your Thanksgiving dinner (besides sparkling wine, of course.) 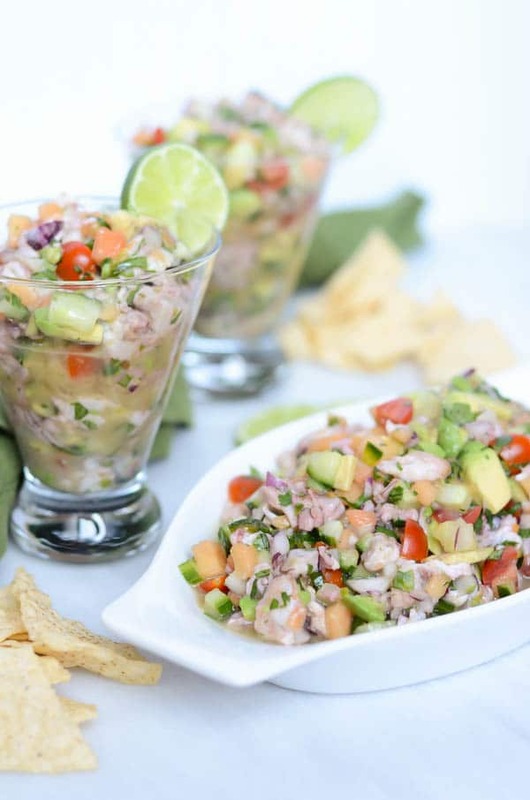 It also pairs wonderfully with slightly heavier seafood, such as salmon or seared tuna. Nowadays, you can find Pinot Noir in all shapes and flavors. Some like it more on the minerally side (not my favorite) but there are also plenty of fabulous representations that are more jammy, rounded and fruit-forward (my personal preference.) 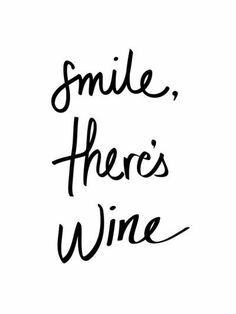 Either way, you definitely need to stock up on this varietal for the holidays! What to Eat with Pinot Noir? The Scoop: The other “basic” red wine. I have to admit, I had all but given up on Merlots until our trip to Napa the other weekend, where we tasted not one, not two, but at least THREE absolutely fantastic Merlots. Folks, I think we’re seeing a resurgence. Gone are the Sideways days of bashing this classic red varietal. What we’re seeing now is pretty exciting. What used to be a one-dimensional wine is taking on multiple dimensions and, dare I say it? There’s actually some complexity to these wines! So go get yourself a Merlot from a top producer stat. You won’t be sorry. 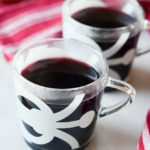 What to Eat with Merlot? The Scoop: THESE ARE NOT THE SAME GRAPE. No, they are not, but they’re fairly similar which is why I’m lumping them together and hoping you’ll forgive me. The main difference is that Syrah is smoother and more refined, with a hint of smokiness. Petite Sirah is bigger, more of a heavy hitter, tannic and bold. They are both mysterious and intriguing, and only get better when paired with food. What to Eat with Syrah/Petite Sirah? The Scoop: If I’m going to drink Zinfandel, I’m going to drink a really. good. Zinfandel. There are plenty of Zins that are way too fruity, with an old, musty quality. To me, a newly opened bottle of these types of wine taste as if they’ve been opened for a few days. Not my jam. But occasionally I come across a perfectly balanced Zinfandel that has me running for the barbecue. The type of Zinfandel that has just the right amount of fruit, with a dusty or smoky quality (and plenty of alcohol) to finish off the palate well-balanced, leaving you wanting more. My best advice? Keep your eyes out for the diamonds in the rough. They’re well worth it! What to Eat with Zinfandel? The Scoop: Again, I’m lumping way too much together, but we’ll save the extreme breakdown for some other posts. Sangiovese is one of the (if not, THE) most popular varietals in Italy, and deservedly so. It’s BIG, and you’ll need some big food to go with it. 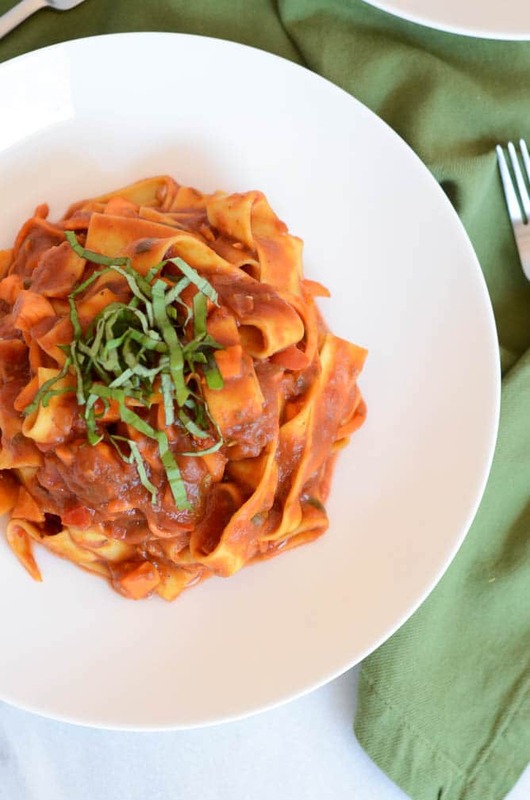 It’s no lie when they say that the best food to pair with a wine is the food that’s made in the same area the wine is made in, and Sangiovese is no exception. What to Eat with Sangiovese?